Watch full Naruto Shippuden Season 20 Episode 32 English Dubbed full HD online. Naruto Shippuden Episode 445 English Dubbed online for free in HD. A group of Sand shinobi have lost track of their target. From above, Deidara flies on his dragon, and sends one of his clay figures their way, killing them. Zetsu watches it from afar, and its halves discuss Deidara, who arrives shortly. They are met by Hidan, who berates Deidara for blasting the Sand shinobi, and Kakuzu, who manages to retrieve a body not too damaged. They all leave together. Naruto manages to unmask the Root member fighting him, revealing her to be Anko. Shikamaru realizes their mission is to ensure Sasuke reaches Orochimaru, and has the group flee from the fight and continue pursuing Sasuke. Lee stays behind to stall the Root shinobi, but one of them engages him, allowing the others to continue. Lee takes off his weights and opens the fifth of the Eight Gates. Kakuzu delivers the corpses to a bounty station. Zetsu, Deidara, Kakuzu, and Hidan meet up with Sasori, who intervenes when an argument begins between Deidara and Hidan. Hidan accuses Sasori of siding with Deidara, and in turn is reminded of the Hizashi incident, and that Akatsuki as is might exist because of Deidara. He was the one responsible for the explosion that destroyed the village and killed Yahiko years ago, and Sasori presented Nagato and Konan with a Flying Raijin Kunai, blaming Minato and Konoha for the explosion. In Ame, Nagato vows to make Konoha know his pain, through the Deva Path, using Yahiko’s body. 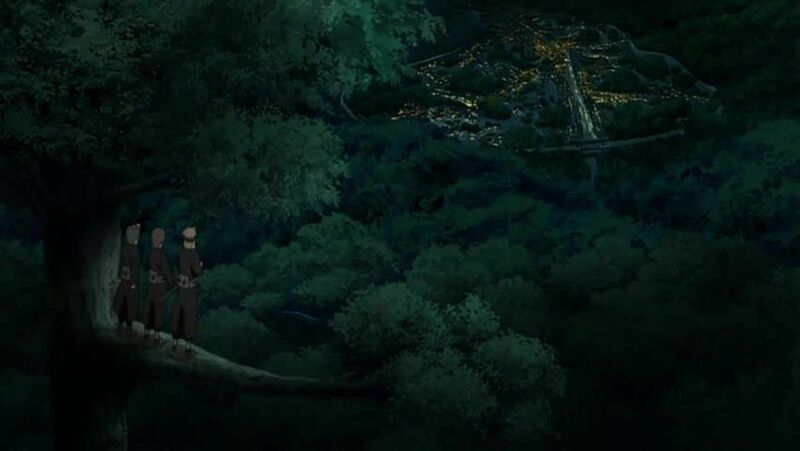 Lee fights the Root shinobi, and Tenten stays behind to stall another when they begin to catch up with the group. Orochimaru waits for an approaching Sasuke. Naruto, Neji, and Shikamaru continue to give chase, followed by two remaining Root shinobi.